NEW YORK—We are besieged by a myriad of images. Yet some pictures command our attention—even in this age of distraction. Few pictures, however, can elicit tears of wonderment. And even fewer can claim to have a function like speeding up one’s ascent to heaven, no less. If you visit the current exhibition in the small Cabinet Gallery of The Frick Collection, you might hear someone gasp in amazement. 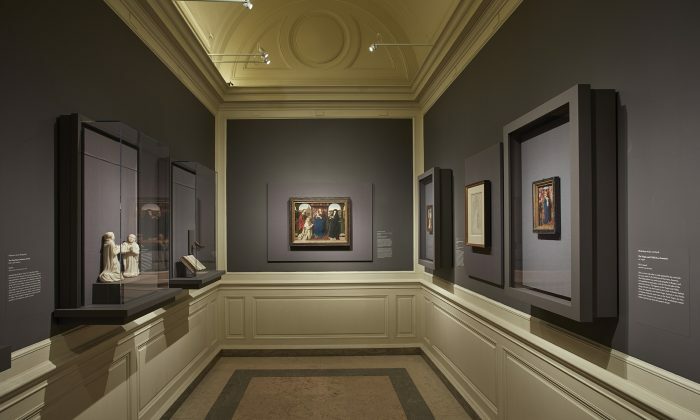 “The Charterhouse of Bruges: Jan van Eyck, Petrus Christus, and Jan Vos” is on view at The Frick Collection until Jan. 13, 2019. Beautifully curated by Emma Capron, the Frick’s 2016–18 Anne L. Poulet Curatorial Fellow, this small exhibition has the power to command all of your attention. You may discover a small figure hidden in the bushes in the background of the central painting, or feel mesmerized by a vivid portrait of a bearded man who seems to be looking straight through you, or you may simply admire how the artists rendered textures so vividly. As you linger over the medieval works, with a magnifying glass in hand, losing track of time, you might hear yourself gasp as well. 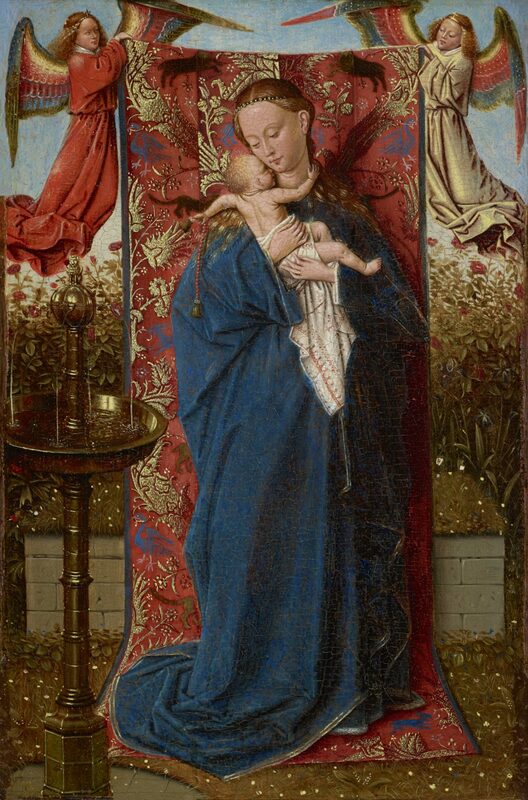 The exhibition centers around a painting from the Frick’s permanent collection, “The Virgin and Child with St. Barbara, St. Elizabeth, and Jan Vos” (the “Frick Virgin” for short) by Jan van Eyck and Workshop. It has been a rather overlooked treasure of the collection because it usually hangs in the Ante Room behind a console, under less than ideal lighting conditions for such a richly detailed painting. “It is an object that compels extreme close attention,” Capron said during a tour of the exhibition on Oct. 29. The Virgin takes center stage in the painting, set within an elaborate portico opening to a panoramic cityscape. 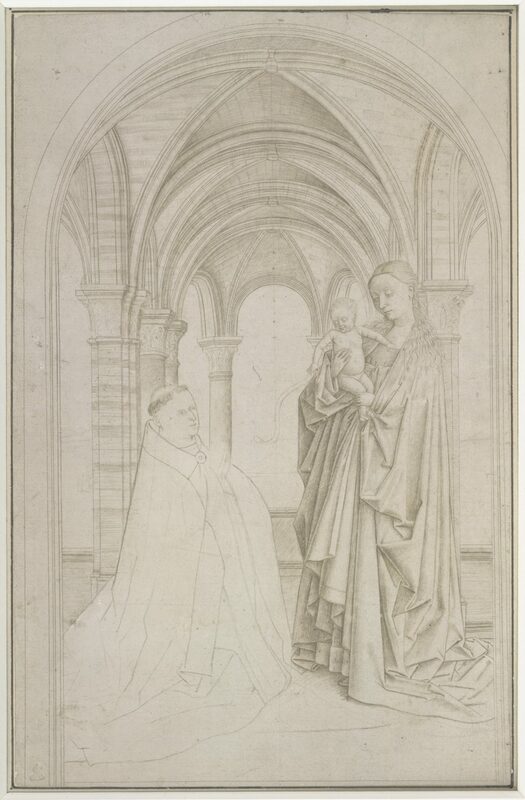 She holds the Christ child, who looks at a kneeling Carthusian monk, Jan Vos, the prior of the Charterhouse of Bruges who commissioned the painting. The Virgin is dressed in a crimson gown, lined with ermine fur, and covered by a blue mantle, hemmed with pearls and precious gems. You can see the artists’ incredible attention to texture, from rendering the opacity of the fabric, contrasted with the translucency of the gems. “The brocade is wonderfully done with quite a swift handling of paint,” Capron said. We see “wet on wet [paint] effects here, in order to give texture to his [Vos’s] bald head,” she added. Every detail in the painting lends itself to multiple interpretations. For example, on the left side of the panel, to the right of the Virgin, stands Saint Barbara, the patron saint of artillery (associated with lightning), who’s depicted with a tower where she was imprisoned by her pagan father. The window of the tower behind St. Barbara is divided by pillars into three sections, referring to the Holy Trinity and to Barbara’s secret conversion to Christianity. On the window ledge of the tower, you may catch a glimpse of a statuette of Mars, the Roman god of war. This alludes to the idols Barbara defaced in her miraculous baptism, Capron said. When Barbara’s enraged father, upon discovering her refusal to recant her Christian beliefs, tried to cut her head off with a sword, he was struck by lightning. St. Barbara is usually depicted with a tower, which became her attribute, in reference to her imprisonment. She was particularly revered by the Carthusians, who highly value contemplation in seclusion. On the right side of the panel, to the Virgin’s left, stands Saint Elizabeth of Hungary, a noblewoman who renounced worldly goods to devote herself to the poor. For the Carthusians, she would have provided a potent model of renunciation of the world. Vos probably chose St. Barbara and St. Elizabeth to be included in the painting because they were both adopted as patron saints of the Teutonic Knights, of which Vos was a past member. That military religious order had origins in the Third Crusade with the aim to defend the Holy Land and to provide medical care for Christians. The longer you look at the painting, the more you find. Using a magnifying glass (provided by the Frick) helps you to see more: for instance, a mole in between Vos’s eyebrows, which distinguishes him. Moreover, the background that van Eyck and his workshop invented depicts a city’s hustle and bustle through a multitude of minute details. The figures of people walking across a bridge look as if they were painted with a one-haired paintbrush (made out of either squirrel or fox hair). One of Capron’s first curatorial ambitions was to allow people to see the “Frick Virgin” in its full splendor. Viewers can experience the painting as closely as a museum setting allows, almost as intimately as the painting was initially intended to be contemplated. 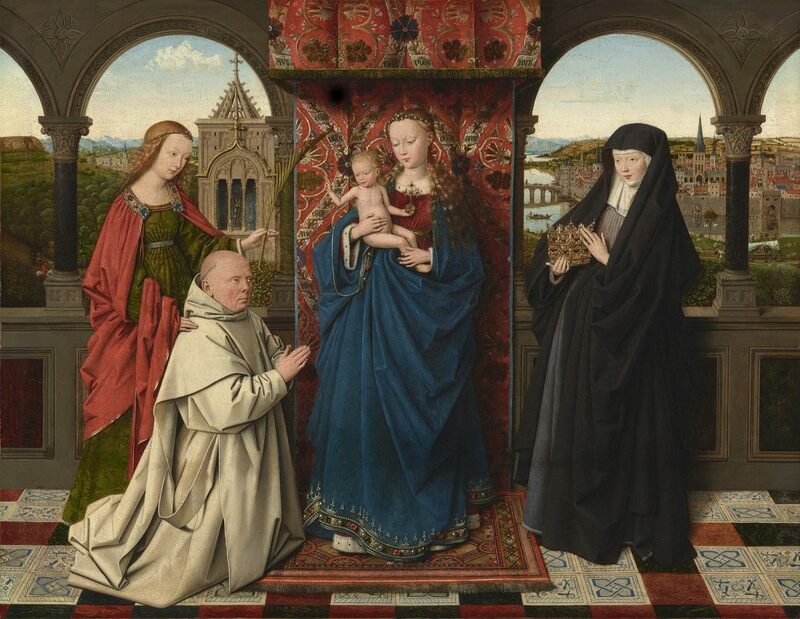 The “Frick Virgin” is joined, for only the second time in history, with a similar painting that was also commissioned by Vos: “The Virgin and Child with St. Barbara and Jan Vos” by Petrus Christus (also called the “Exeter Virgin,” after its first known owner). 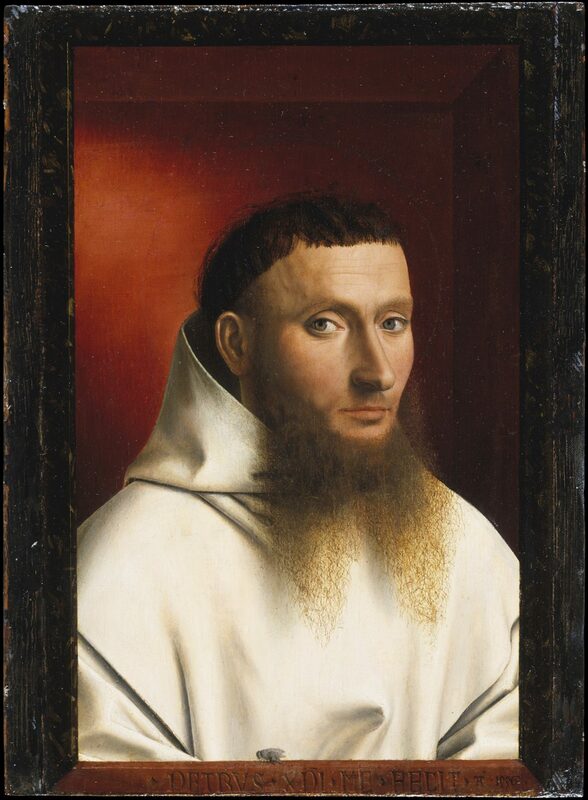 Incidentally, Petrus Christus also painted the distinguishing mole between Vos’s eyebrows. 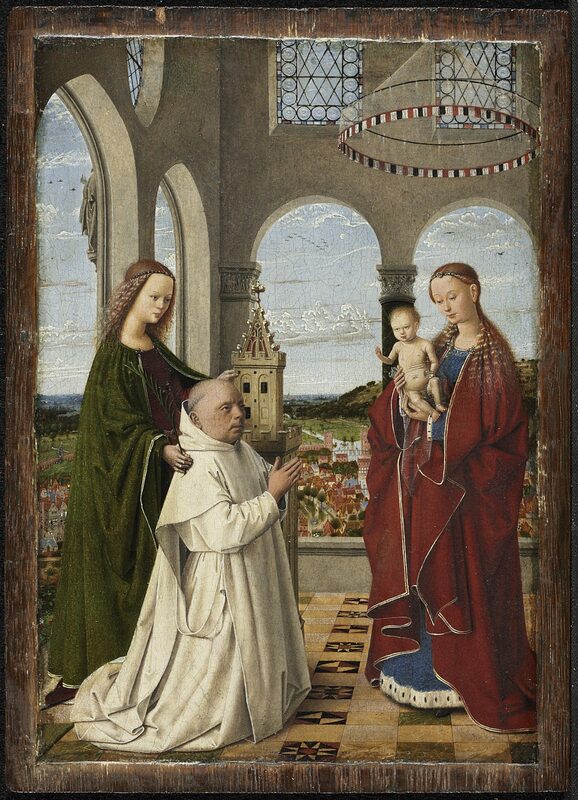 Both portray Vos kneeling and seeking intercession of the Virgin and Child, under the protection of female saints. While similar in subject matter, composition, and style, these two panels had different functions. The “Frick Virgin” perhaps served as an epitaph to memorialize Vos. The red cloth of honor behind the Virgin is brocaded with stylized white lilies, alluding to her purity. Each stem is entwined with a golden scroll inscribed with the abbreviated words “Ave Maria, gratia plena” (“Hail Mary, full of grace”). These were painted not merely as decoration but to engage and invite the viewer to pray. “It was basically an attention-grabbing device,” Capron said. 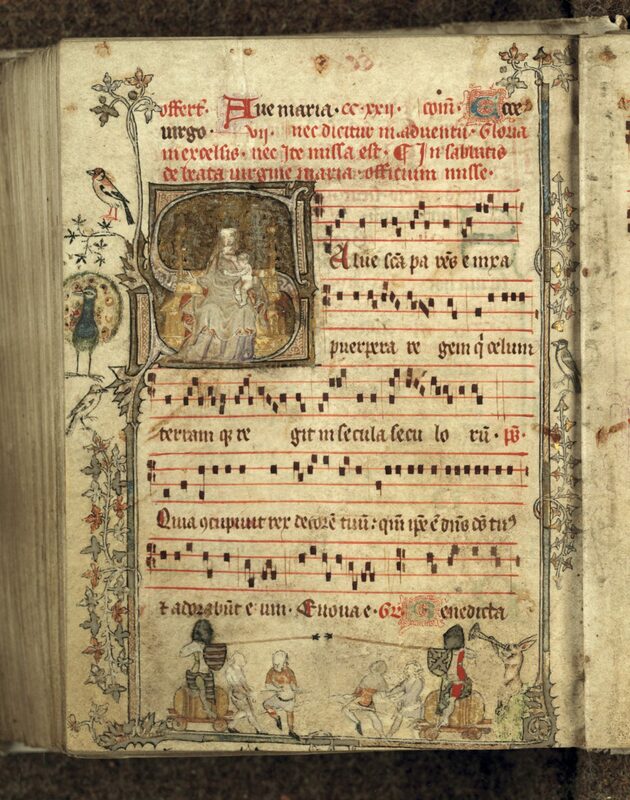 In 1443, Vos secured an indulgence for his memorial, not only to help repose his soul and for his own salvation, but also to hasten the salvation of whomever would pray in front of it. Those who did would be granted 40 days of remission from time served in purgatory. “It is a mutually beneficial offer,” Capron said. In contrast to the “Frick Virgin,” which served its function after Vos’s death, Vos used the “Exeter Virgin” during his lifetime as a devotional aid, in the intimacy of his cell. He could also carry the small panel with him during his travels. Fourteenth-century treatises about meditation practices recommended relying on physical images to help conjure mental ones, Capron explained. That was the first step. Looking at his own likeness in the company of the Virgin, Christ, and St. Barbara would have helped Vos visualize this divine encounter in his mind’s eye. “Eventually [the monks] wanted to reach imageless contemplation, when they reached a state of mystical ecstasy,” Capron explained. These material objects, then, helped the Carthusians climb an immaterial, spiritual ladder to salvation through contemplation and prayer. The elaborate images also helped relieve the strain of the monks’ extreme solitude and isolation, as their eyes would journey through the myriad detailed images in the paintings. It was a cleric who, seeking to embrace the life of early Christian desert hermits, founded The Carthusian Order in 1084. Bruno of Cologne built his first hermitage in the secluded Chartreuse Mountains (from which the order took its name) in the French Alps. Since then, the Carthusian Order has been extremely austere and, especially in the Middle Ages, highly respected for its purity. Carthusians believe that solitude and silence are the absolute conditions for spiritual elevation and eventual salvation. They avoid contact with the laity, even with each other as much as possible, and take a vow of silence. It is quite fascinating then, as Capron pointed out, how such incredibly splendid images, such as the Frick and Exeter Virgins, emerged from such an austere place. 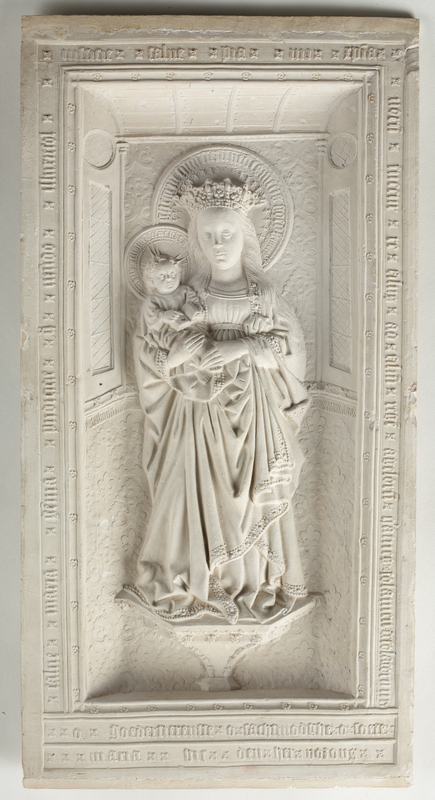 Capron juxtaposed these two paintings of the Virgin along with a selection of objects that are just as mesmerizing: two more paintings, two small marble sculptures, a silverpoint drawing, a songbook, a boxwood prayer nut, and an intact pipe clay relief (which is a national treasure of the Netherlands). Together, they reflect and strengthen the context and meaning of the origins and functions of the two paintings commissioned by Vos. 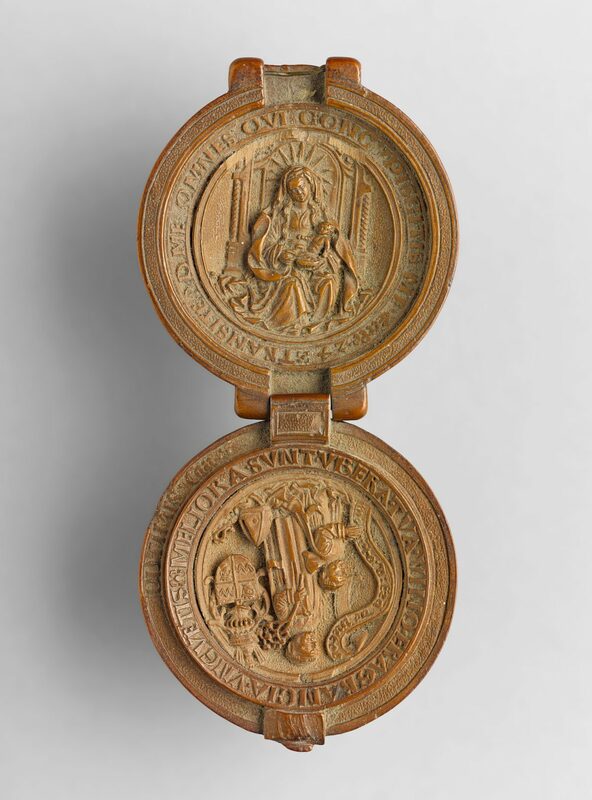 “Prayer nut for the Carthusian François du Puy,” circa 1517-21, by Adam Dircksz and Workshop. As the indulgence attached to the “Frick Virgin” stipulated that it was only effective in the confines of the charterhouse, it has lost its original function. Similarly, the “Exeter Virgin” is no longer used as it was originally intended, as it has been released to the secular world for all the laity to see. 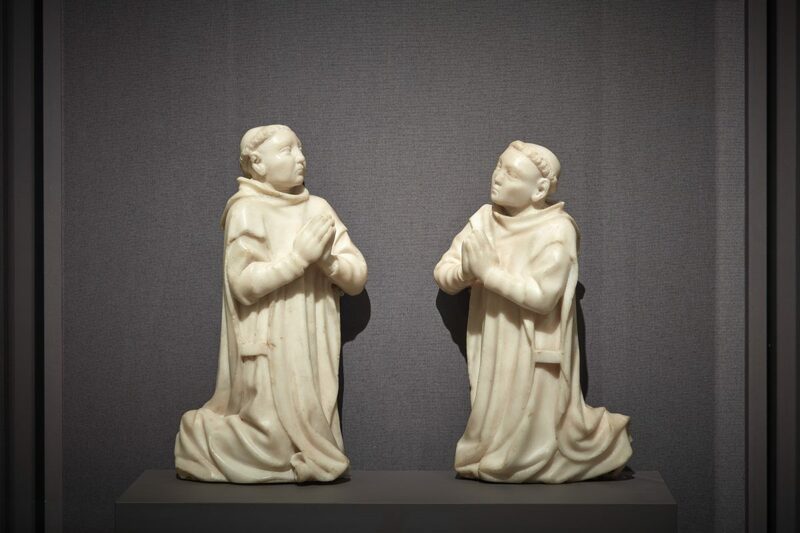 These two paintings are invaluable not only because they were commissioned by a Carthusian monk, which is very rare, but also because they survived the destruction of the two charterhouses that Vos led during his career. Today, they may be admired more for the artistic mastery of van Eyck, his workshop, and Petrus Christus than for the original spiritual intent Vos had invested in them. 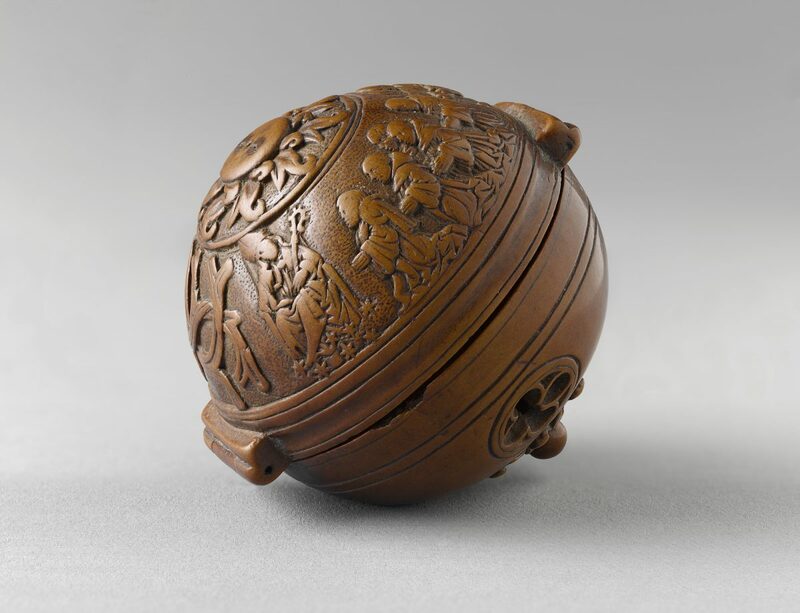 Yet within the Cabinet Gallery of the Frick, echoing the monastic context of the objects on display, the exhibition provides a portal to understanding a contemplative way of life. For a moment in time in the Frick, away from the bombardment of the superficial images that we are usually confronted with every day, “The Charterhouse of Bruges: Jan van Eyck, Petrus Christus, and Jan Vos” exhibition gives a welcome respite. Emma Capron: “Jan van Eyck, Petrus Christus, and the Charterhouse of Bruges” from The Frick Collection on Vimeo.